Sometimes you wake up, and desire a substantial breakfast instead of another bowl of Multi-grain Cheerios. This morning was one of those mornings. As I started poking through the fridge, I realized that I could make a scramble – not an omlette; the outer “crust” where the eggs seal together has never been appealing to me – and by digging deeper into the recesses I found some items that would lend well to me trying out something new. Mmmmmm. Sounds good already, right? So this one was pretty simple. 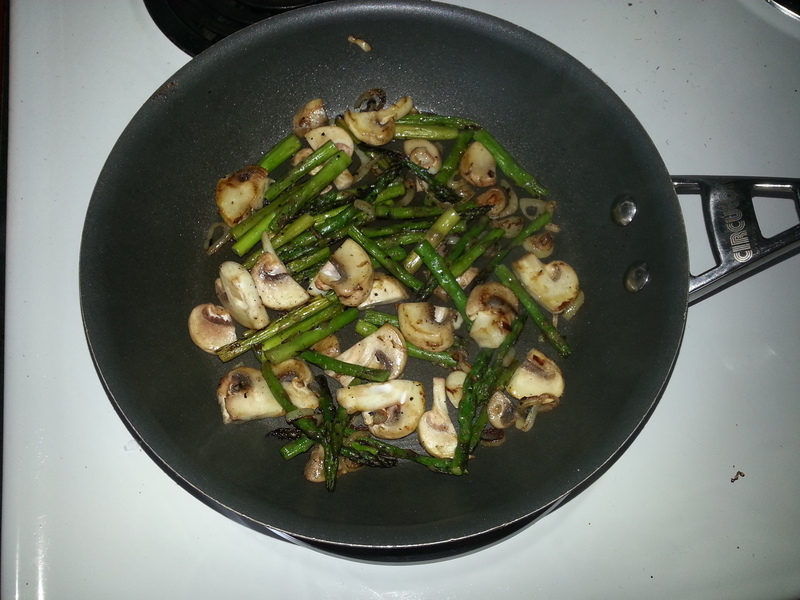 I browned up the diced shallots with a tab of butter (3 min over medium heat), and then added the mushrooms and the asparagus, which I had cut into bite-sized pieces. After another four minutes in the pan, I transferred the veggies to a bowl, and started the eggs for a minute with another small tab of butter. As the eggs started to firm up, I crumbled about four tablespoons of herb-coated goat cheese on top, and folded in the veggies. The result was – while not the prettiest – absolutely delicious!